Creating character silhouettes is the perfect activity for the close reading of character or a figure from an assigned or selected fiction or nonfiction text. 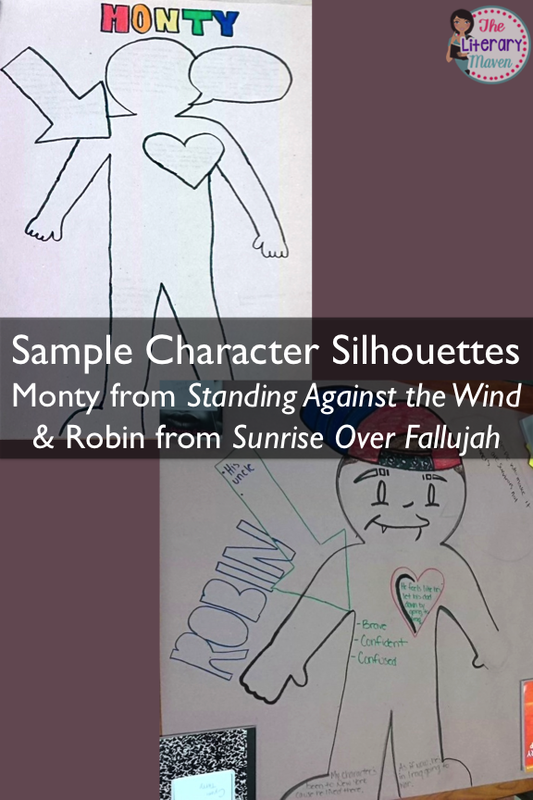 Like literary postcards, character silhouettes are an activity that can be used with any grade level and can be used to reinforce the ideas of character and characterization. 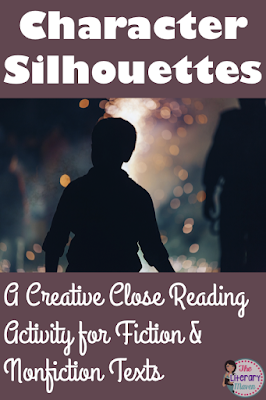 This activity can be done during or after reading with any short story, novel, play, or nonfiction text. You may have all students in a class focused on the same character or have different groups focusing on different characters. Whether you allow students to select a character or you assign one to them, you can later group students who are focused on the same character. 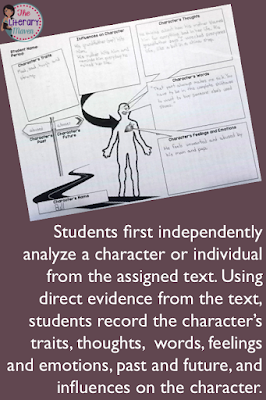 But first allow students to begin their analysis independently. 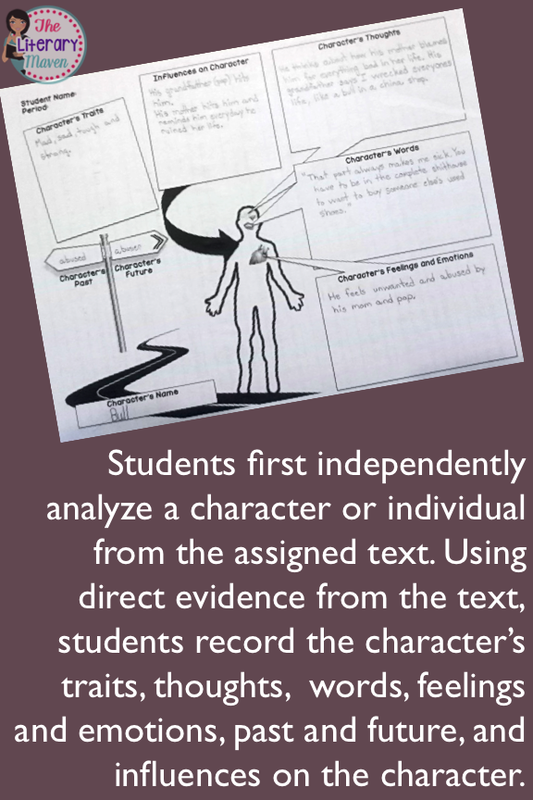 Students will record the character or individual's traits, thoughts, words, feelings and emotions, past and future, and influences on him/her. Encourage students to use direct evidence and quotations in the text as much as possible. This independent analysis can be used for accountability (grading) and ensures that all students are participating once they join a group. You may assign students to groups or allow them to choose their own, but students in a group should have analyzed the same character. Once in their group, students can share their analysis and as they listen to others, add any key points about their character they might have missed. Distribute a large piece of paper or poster board to each group to begin drawing their character silhouette. 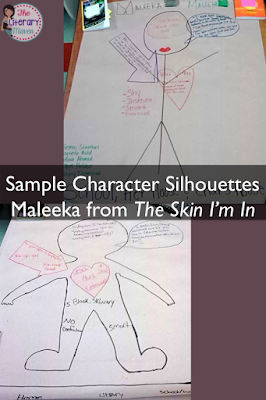 Because of the size of my paper, I asked students to draw an outline, but if you have large enough paper (or small enough students) you could have them trace an outline of one of the group members' bodies. I use literature circles in my classroom and this activity is perfect for a literature circle group to work on. 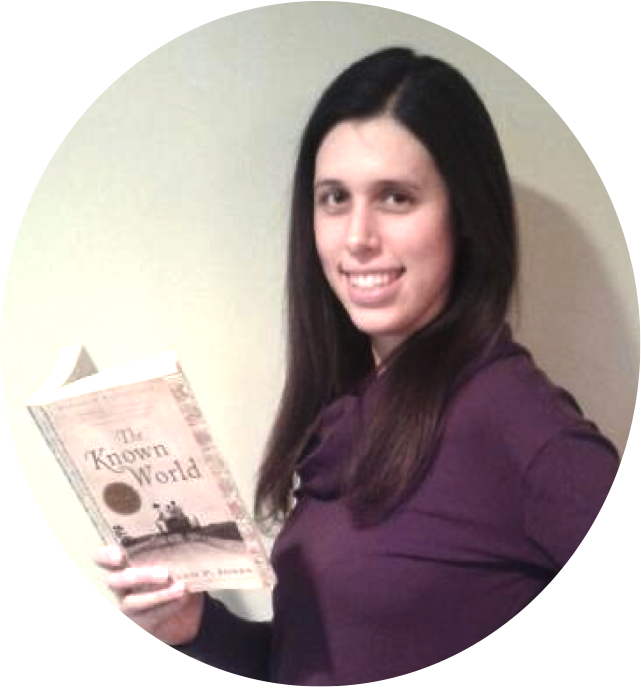 All students can contribute even if they are in different places in the book and learning about the character from their group members may re-engage reluctant readers. You can also assign parts of the character silhouette or have students choose which part of the silhouette they will be responsible for completing to increase accountability with in the group. These are great visual reminders to have hanging in the classroom and students can even add to them as they continue to read. This activity could be used at any grade level and in any content area. History teachers could ask groups of students to complete character silhouettes for different generals from the Civil War, science teachers could use famous scientists, math teachers could use famous mathematicians, etc. Standard #3, which at the ninth/tenth grade level reads: "analyze how complex characters (e.g., those with multiple or conflicting motivations) develop over the course of a text, interact with other characters, and advance the plot or develop the theme." You find find the resources and directions for this activity here as well as other activities for any literature text here. If you try these out in your classroom I would love to hear about how you used it and how it went.